Rossiya-24 television has reported that Yelena Obraztsova, people's artist of the USSR, has died in Germany. A press officer for Obraztsova told Interfax in November 2014 that doctors had recommended that the opera singer leave Russia for Germany for the winter because of the climate. For that reason, her concert scheduled to be held in the State Kremlin Palace on December 11 was cancelled. Yelena Obraztsova, people's artist of the USSR, was born in Leningrad on July 7, 1939. She performed in the largest theaters and concert halls of the world, including the Milan La Scala, the New York Metropolitan Opera, the London Covent Garden, and the Vienna State Opera. In 1975, Obraztsova was recognized as the best singer of the Carmen part at a festival devoted to the 100th anniversary of the opera Carmen. 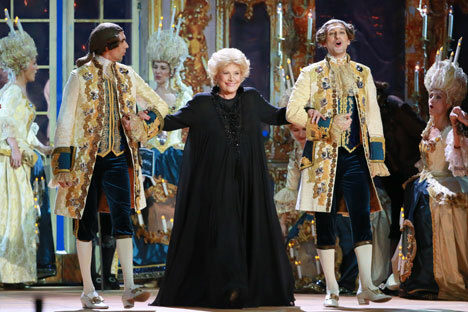 In 1978, when La Scala celebrated its 200th anniversary, Obraztsova received the Golden Verdi Prize for her performance of Verdi parts in the Milan theater. In 1978 she also played the title role of Carmen opposite Plácido Domingo in Franco Zeffirelli's television production of the opera. She also appeared as Santuzza in Zeffirelli's film version of Cavalleria rusticana in 1982. Obraztsova gave seminars in Europe and Russia and chaired the juries of some European and international contests.